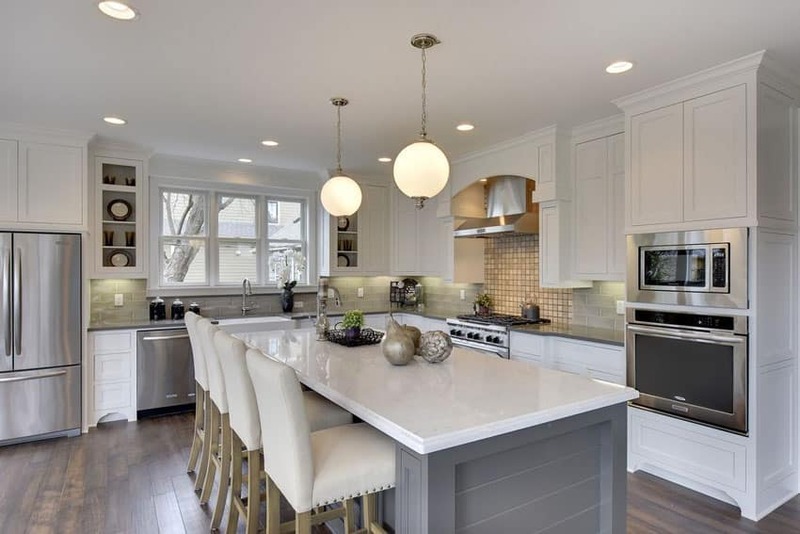 Here’s our gallery featuring white kitchen with gray island design ideas including contemporary, modern and traditional styles. 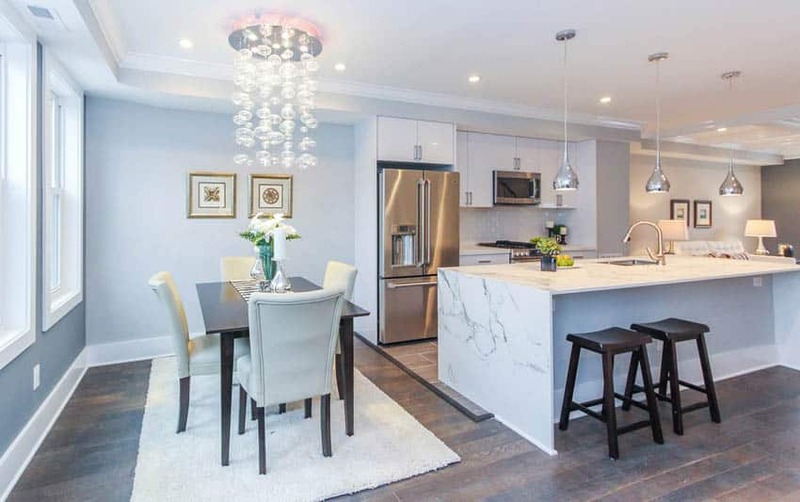 Common spaces in the house, such as the kitchen, are a place we expect to be used a lot and we tend to pay a lot of attention making it look beautiful and upgrading it with durable appliances and finishes. A total kitchen overhaul could really put a dent in your wallet, so unless totally necessary, most would just leave their kitchen as it is. That is why choosing a very timeless design & look for your kitchen is the smartest way to decorate it. “Timeless” are those that have been proven classic kitchen designs that never go out of style. To create a timeless kitchen design is to keep it as simple as possible – avoiding kitsch or trendy items just because, and try to select simple and functional items and styles. 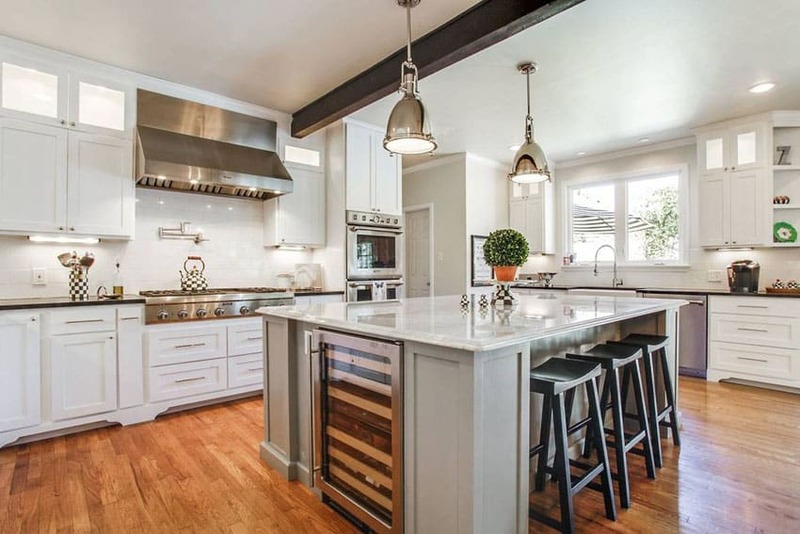 When it comes to colors, it would be best to choose neutral palettes – white and gray are really fool-proof kitchen classics that can easily stand the test of time. A white cabinet kitchen with gray island can provide just the right amount of contrast and visual interest. 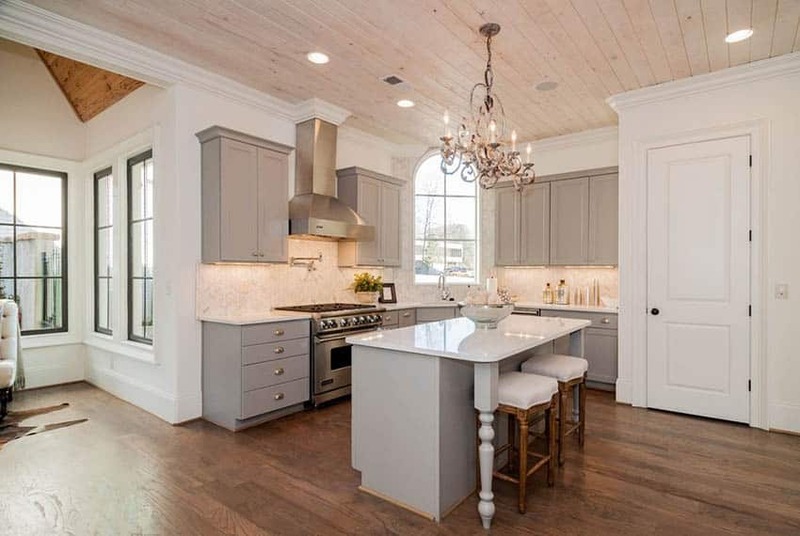 The kitchen pictured above combines classic all white cabinets with a warm gray kitchen island at the center. The large kitchen islands functions as a small dining area, as well as additional storage space and worktop. This beautiful gray and white kitchen design features an interesting combination of classic and modern aesthetics. Using traditional style paneled kitchen cabinets, this kitchen gives it a more modern appeal by forgoing the door handles/knobs for a cleaner, pull-less look. Since the kitchen is on an open plan layout, the gray kitchen island is used to divide the space of the kitchen from the rest of the house. This transitional white kitchen design is a great example of combining classic and modern aesthetics. Traditional style kitchen cabinets with gold pulls were combined with a modern modular kitchen island in gunmetal gray. Topped with a thick slab of marble and adding unique accessories such as the gold faucet and the geometric drop lights, this kitchen definitely looks “instagrammable”. 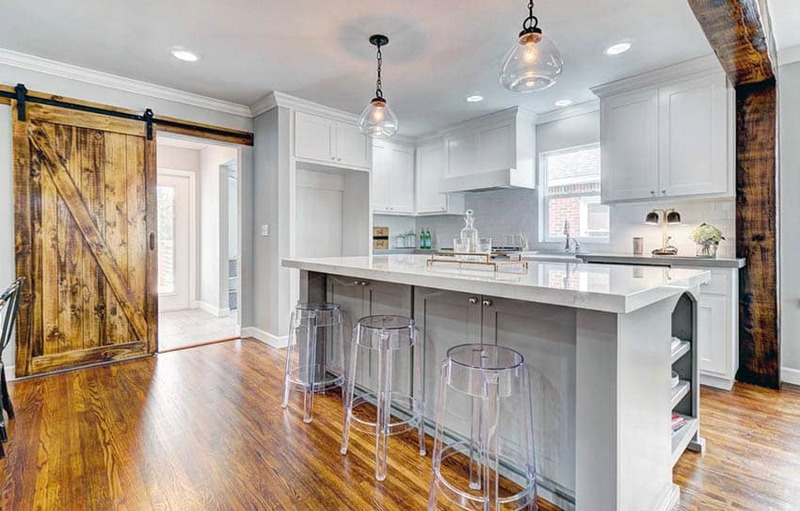 Due to the very limited space available, this small kitchen used transparent bar stools to go with its gray kitchen island – a unique yet effective approach. A sliding barn door and rough sewn overhead wood beam provides just the right amount of a rustic touch to this otherwise contemporary design. The ceiling height is taken advantage to maximize storage space for this l-shaped kitchen space. 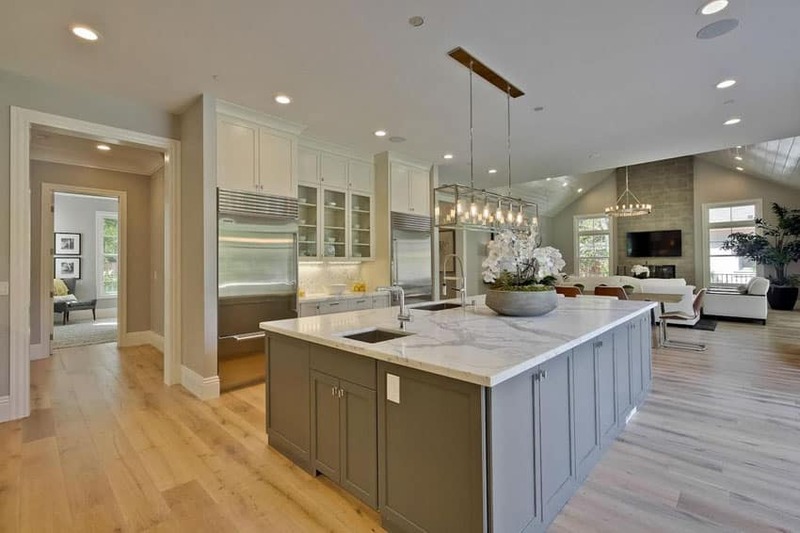 A medium sized kitchen island with gray base cabinets was used to divide the space from the rest of the house, and to add additional dining space as well. 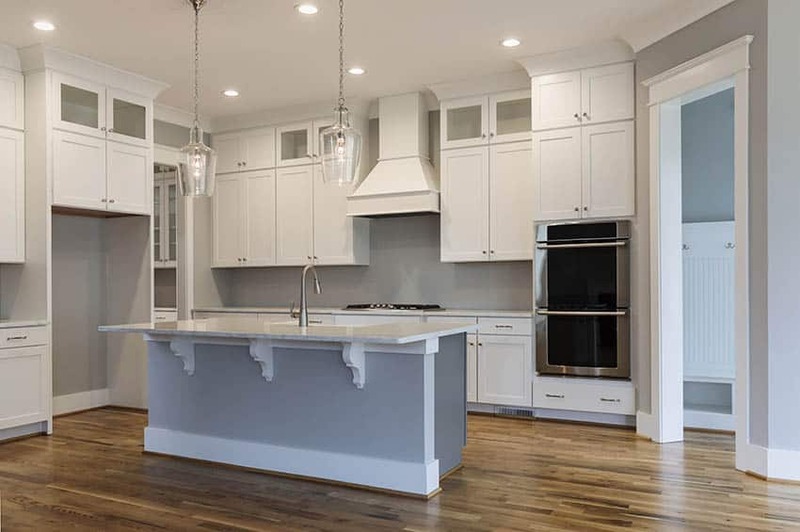 Despite the really detailed door panels on the cabinets and the very traditional aesthetic, the combination of white and gray helps give this traditional style kitchen a more contemporary appeal that would definitely remain stylish in the years to come. The advantage of white and gray is that they’re very adaptable colors. Whether your add a warm-toned or cool-toned accent color, no matter how subtle, white and gray would never compete against it, and instead complement it. Which is why using gray and white is an excellent color palette choice for kitchen designs. This example shows an l-shaped kitchen with white and gray accents in a traditional style. 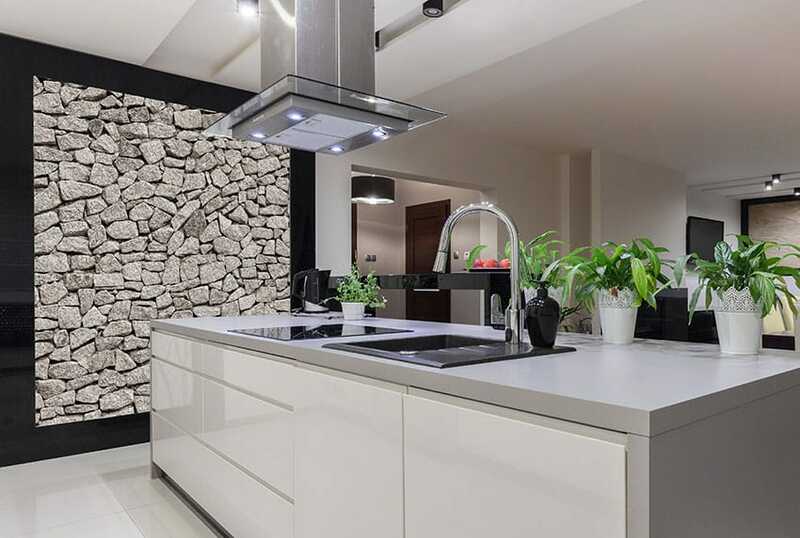 For those into a more modern look, you can try combining your white modular cabinets with gray or dark gray quartz or solid surface counter top for a more minimalist aesthetic. 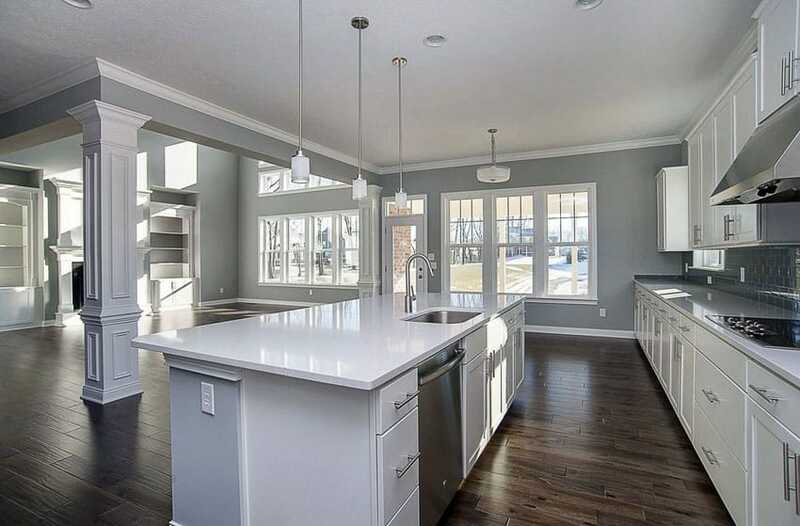 This light gray kitchen island with columns is definitely the focal point of this kitchen space. To maximize the amount of legroom, the counter top has a large overhang from the base cabinets and is supported by wooden leg posts. The white shaker style cabinets look stylish combined with white and gray quartz countertops and light hardwood flooring. 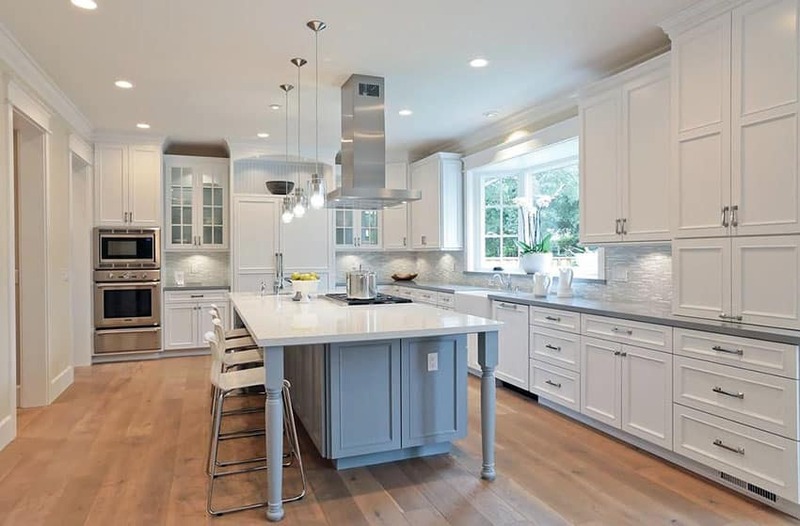 This contemporary kitchen design combines white European style cabinets with light gray painted island and gorgeous Calacatta Classic marble counters with a waterfall design. The walls are painted in the same gray color as the island. 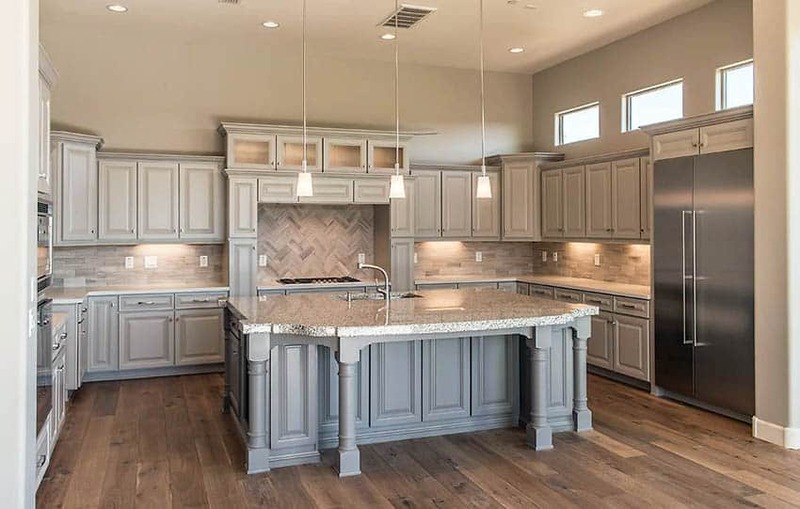 The distressed hardwood floors add a luxurious feel to the open concept design, while the kitchen’s center features wood look porcelain tile flooring. 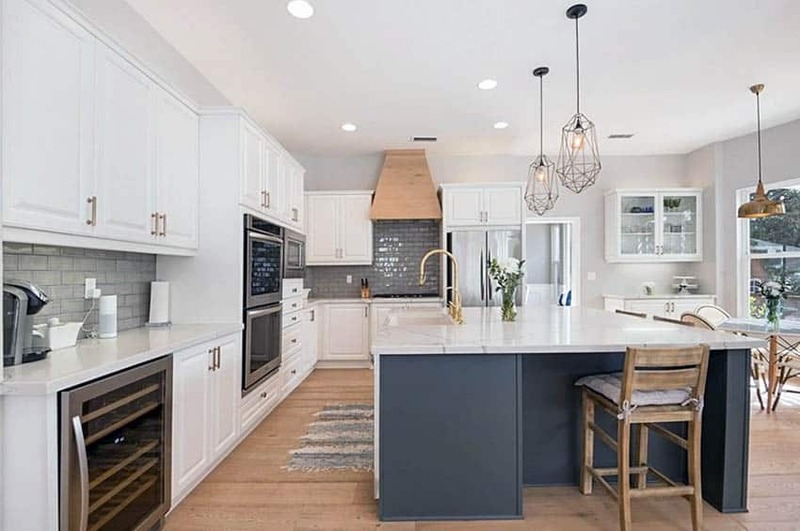 This l-shaped kitchen with gray cabinets and white countertops and walls looks appealing with its dark wood floors and bleached wood ceiling planks. This corner kitchen space managed to place a small island to add to the food preparation area, as well as functionality as additional dining space. A combination of white and gray for a kitchen island design is a harmonious choice that works with practically any style. Using a gray painted base cabinet and white marble or quartz countertop is a popular choice to this day. This kitchen island is attached against a fixed/built-in low wall in which the electricity and the plumbing runs. 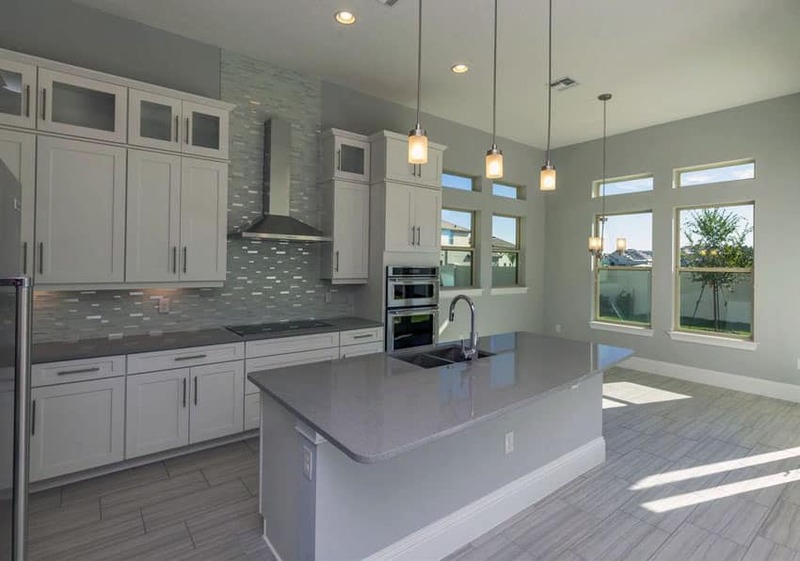 The low dry wall is painted in gray, while the modular cabinets are in white to match the rest of the kitchen cabinets. The white carcass and doors perfectly stands out against the gray-painted walls and the gray backsplash tiles. This modern modular kitchen island uses glossy white-laminated base, paired with gray solid surface top and sides. A stacked stone accent wall with a dark border provides a focal point for this open concept kitchen. A massive kitchen island like this boasts a lot of storage space and work surface. The massive white marble also gives it a very soft contemporary aesthetic that has been proven to be a timeless classic material of choice. 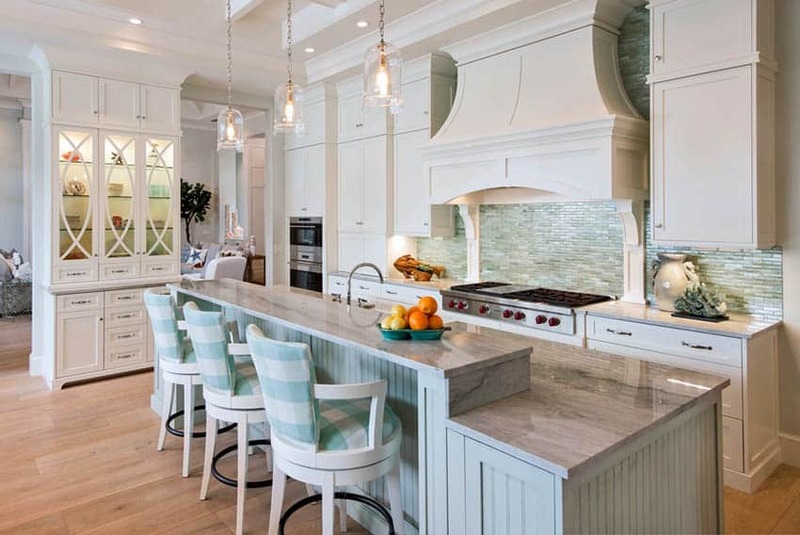 See more kitchens with white marble countertops here.